ClearScore win three awards, while BTCPOP and Mr Lender take home two. 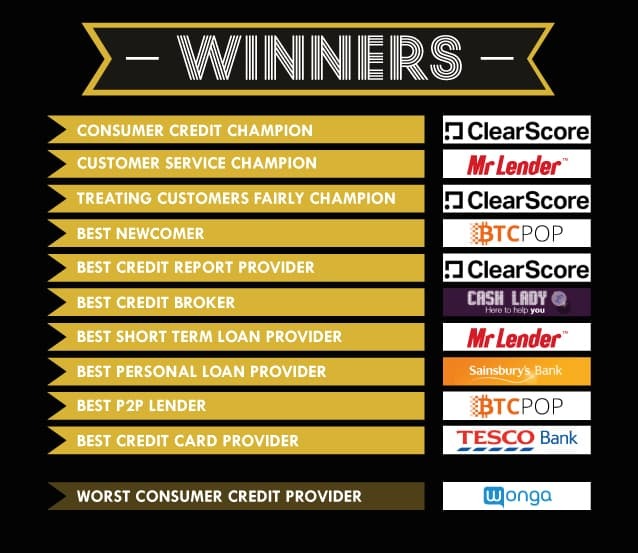 The winners of the inaugral Consumer Credit Awards have been decided ClearScore, BTCPOP, and Mr. Lender win multiple awards, with Wonga being named your least loved credit provider. ClearScore, the credit reporting company, was an overwhelming favourite with a rating of 4.88 overall making it the highest-rated product in the awards. It also clinched the award for "Best Credit Report" beating the likes of Experian and Noddle, and also won the "Treating Customers Fairly" award. "Best Newcomer" and "Best P2P Lender" were awarded to BTCPOP, a bitcoin peer lending platform launched less than eighteen months ago. Short term loan provider Mr. Lender also won multiple awards - taking the "Best Short Term Loan Provider" award, as well as being named "Customer Service Champion" for it's highly praised levels of customer service. It wasn't all good news for short term loan providers, however, as at the bottom of the voting, Wonga wins the dubious award of being your "Worst Consumer Credit Provider" with an overall score of only 2.45 / 5. Overall satisfaction with consumer credit is rated at 87% suggesting that perhaps credit providers don't deserve all of the bad press they sometimes generate. With 80+ brands represented, and over 2500 consumers telling us about their experiences, the Consumer Credit Awards is one of the largest independent surveys of consumer credit credit carried out this year. Want to read our customer insight? If you're interested in reading what consumers saying about their credit providers - take a look at our summary insight dashboard. Click here to read the full dashboard. "Top-rated Short Term Loan Providers"
Wonga - read our public wonga complaints here. Thanks to everyone in our community and all of the brands who took part. If your favourite brand didn't win, leave them a review and better luck for 2017!